Meals were brought to the door and tasted while singers and musicians performed outside the chambers. Meanwhile, Shajarat al-Durr arranged for a boat, and disguised in black robes, she accompanied her husband's body under cover of night up the Nile to Roda Island south of Cairo, where the Mamluk troops were stationed. There, she hid the corpse and issued orders—also forged—for construction to begin on al-Salih’s mausoleum. Yet as successor to his father, Turan Shah quickly began making missteps. “He had no confidence but in a certain number of favourites, whom he had brought with him from [Syria],” Al-Makrisi recorded, and this sidelined the Mamluks. One of her first acts as sultana was to conclude a treaty with the Crusaders that returned Damietta and ransomed Louis ix. These terms she negotiated with her French counterpart, Queen Margaret of Provence. 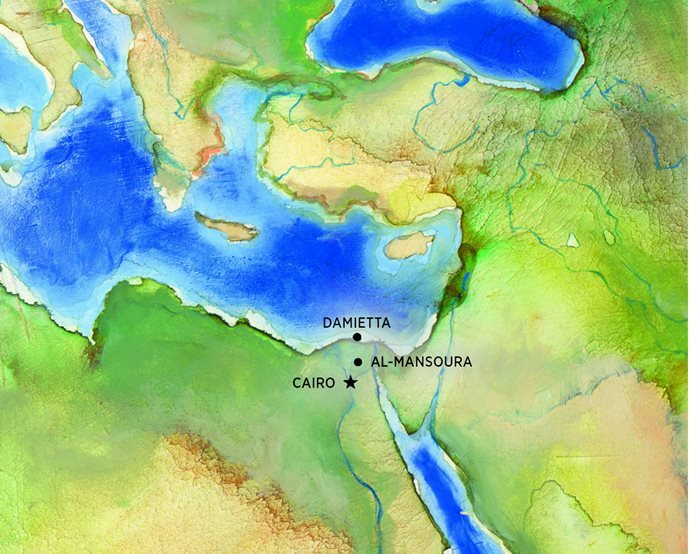 Thus the Seventh Crusade ended with the diplomacy of two queens—one Muslim and one Christian. By 1254 Aybek began to tire of his nominal role. He quashed a rebellion or two and fought bitterly with Shajarat al-Durr over al-Salih’s treasure, which she kept hidden. In 1257, seeking to increase his power, Aybek intended to take a second wife, a daughter of a powerful prince. To Shajarat al-Durr, this was treason against both queen and sultanate. Aybek moved into a pavilion by the polo fields. She claimed Aybek had died in his sleep, but this time the Mamluks refused to protect her. Accounts say she passed several days under arrest in the Citadel, grinding her jewels and beloved pearls to dust, so that no other woman could wear them. Aybek’s 15-year-old son Al-Mansur Ali—son of the jilted Umm ‘Ali—succeeded as sultan. He offered Shajarat al-Durr up to the justice of his mother, who had her former rival “dragged by the feet and thrown from the top” of the Citadel, according to 15th-century historian Ibn Iyas. Her remains were interred in the tomb she had commissioned for herself, one of Cairo’s most exquisite. Its mihrab, or prayer niche, is decorated in Byzantine glass mosaics, the oldest in the city, and its centerpiece is a “tree of life,” adorned with pearls.